Amy Gorin, a registered dietitian and nationally recognized nutrition expert, shares her list of more than 20 foods that we should be eating every day, especially after you’re 30. 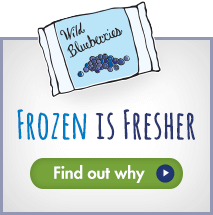 Frozen Wild Blueberries make the list because they are rich in polyphenols. She suggests adding them to smoothies. Registered Dietitian and Food Blogger Jenny Shea Rawn shares her easy-to-make, heart smart and nutrient-rich and indulgent tasting breakfast recipe – Wild Blueberry Chia Breakfast Bowl. This recipe features antioxidant-filled Wild Blueberries, quick cooking oats which are high in fiber, heart-smart omega-3 rich chia seeds. Prevention ranked Wild Blueberries as one of the healthiest foods for women. Researchers at Cornell University found that tangy-sweet Wild Blueberries pack the most absorbable antioxidants compared to 25 other fruits. Ronald Prior, adjunct professor of food science at the University of Arkansas in Fayetteville, recommends adding a ½ cup of Wild Blueberries. He says this step alone will provide consumers double the number of antioxidants most Americans get in one day. Nice creams, a non-dairy variation of traditional ice cream made with puréed frozen bananas, is a hot food trend, and Amy Gorin, a registered dietitian and nationally recognized nutrition expert, advises on how to make it at home with Wild Blueberries thrown in for extra nutrition. Cutting back on sugar is easier when you have a number of go-to-snacks that help satisfy a sweet craving, and this Crunchy Wild Blueberry Cereal recipe from nationally recognized health expert Frances Largeman-Roth is a sweet treat with zero added sugar that will do the trick. Add some flare to your margaritas this summer with Registered Dietitian Kara Lydon’s Hibiscus Margarita Recipe. The drink has a refreshing floral flavor – one of the top food trends of 2018 – plus the Wild Blueberries give it a surprise nutritional punch. Amy Gorin’s Wild Blueberry Lavender Smoothie is a relaxing, soothing drink, perfect for summer, plus it’s rich in polyphenols from the Wild Blueberries and studies show that this micronutrient may help protect skin from the harmful effects of sun damage.